"Is anyone home?" called Chanel, just coming home from school. Chanel was a royal Aisha, who just turned 13 years old. She got good grades, her family had more Neopoints then most, and she was well liked in school. She was just what every girl in Neopia wished that they could be. "We are in the living room!" called Lea, her sister. Lea was a royal Cybunny. She was 10 years old, the youngest in the family. She was well liked and had good grades too, but she hated her life. She didn't like the fact that Chelsea, her mother, could go and spend 2 million Neopoints on a fun trip to Mystery Island anytime they wanted, or that her sister, Chanel, spent nearly 100,000 Neopoints on her dress for her 13th birthday party. That wasn't what life was all about to her. She would rather be poor, grabbing food from the Money Tree and going to the giant omelette then live the rich, extravagant life that she does. She would rather be allowed to go play in the mud when it rains, or play at the beach until she has sand in her ears. She would rather have fun and enjoy life then sit in the house playing with her expensive, rare Usukis and other toys. "How are you doing Lea?" asked Chanel. " School was so dull today. We were learning about Terror Mountain… boring! I don't want to hear about some giant snow covered mountain. I'd rather here about Mystery Island, it's so warm and tropical and fun there! I can't wait for our vacation there!" "I'm doing just fine," answered Lea. "Just fine." Chanel sensed that there was something wrong. She knew her little sister, and she was usually more happy then this. It just wasn't like her. "What is wrong with her?" Chanel wondered. "What can I do about it? I just wish I knew how I could help." The next day at school Chanel decided to visit her sister at lunchtime. When Chanel got to Lea's table, she realized that Lea was sitting by herself then with her 20 some friends that she normally sat with. "Where is everybody Lea? They can't all be sick. What's wrong?" "Why do you care?" snapped Lea. "Why aren't you with your friends talking about how much you spent on dresses and shoes? And what about your new purse? How much did it cost again? Oh yeah, it was 350,000 Neopoints! Why aren't you bragging about that? Hmm?" "Lea, what is wrong with you?" yelled Chanel, who was very hurt by her sister's comment. "I'm sorry that I have good fashion sense. I'm sorry that we are rich and can afford to buy thousands of purses at that price. But is that my fault? I like my things, but I don't brag. I'm leaving now, and by the way it wasn't 350,000. It was 355,000." Chanel ran out of the cafeteria in tears after that. She ran through the halls and ran all the way until she was off school property. She had never cut school before, but she had never been hurt like that. She wanted to get away, and nothing else mattered. Chanel ran home and packed her suitcase full of clothes and shoes and other things she would need. She ran down to the kitchen and grabbed a loaf of bread, some oranges, peaches, and bananas, and then ran upstairs to grab her Kadoatie, Angel. She grabbed 5,000 Neopoints and then ran out the door. She ran and ran until she couldn't anymore. About an hour later Chanel found herself in Meridell, looking at all the sites. She made her way through and went into Brightvale. Then realizing that she was lost, she walked back through Meridell and stumbled into the Haunted Woods a few hours later. Seeing an empty tower, she went inside. Suddenly the lights flashed on and Chanel shrieked at the sight that lay before her. "No need to scream dear, I won't hurt you. I am Edna the Witch. May I ask what you came here for?" "I came in thinking that this place was empty. I suppose since you live here I should leave then," replied Chanel sadly. "Oh please stay, I rarely ever have company. Seeing as you need a place to stay at such a young age, I'm guessing you ran away from home right?" asked Edna. "And who is your little friend? That Kadoatie would be great for one of my potions…"
"Thank you for letting me stay here, but Angel doesn't want to be used in any 'potions' as you call them. And neither do I. But we would be more than happy to stay here with you. I can only stay for a few days though, my family is, well, rich and they will have hundreds of people looking for me. I don't want them to find me." "Oh they would never think to look for you here dearie, nobody ever does. I've housed quite a few runaways. No one ever thought of looking here," Edna said. "No thanks anyway, I don't want to be a burden to anyone. I'd rather just stay here long enough for some sleep and long enough to grab a bite to eat. Then I will be on my way to who knows where." Chanel stayed overnight and then left before Edna awoke the next morning. She slipped out quietly, but not quietly enough for some creatures. She nearly was attacked by a vicious werelupe, and that isn't an experience that she wants to relive. So she made her way out of the Haunted Woods and soon found herself in the Lost Desert. "Wow Angel look! The Lost Desert! It is so beautiful! Let's go around and look at all of the cool places. I've always wanted to see Coltzan's Shri…" She was cut off when a big muscular guy blocked them. "Halt! Who goes there?" he asked. "I…I'm Chanel and this is Angel," Chanel stammered. "D…did we do something wrong?" "No, nothing wrong was done by you. I am just supposed to make sure none of Sloth's known minions get in to the Lost Desert. We wish to keep our kingdom safe, especially since the death of King Coltzan. You may enter the Lost Desert and see the magnificent beauty of the kingdom." Chanel gasped at the sight that she saw. It was magnificent, just as the guard had said. No, it was better than magnificent. It was spectacular! She had never seen anything quite as wonderful as this. But she couldn't stay long, and she knew that. Chanel walked around the desert, grabbed a bite to eat at the food stall, went to the scratch card stall and played a few, and then decided that it was time to leave. So she and Angel made there way up the coast and finally found their way into Neopia Central. Neopia Central was not a place Chanel visited often. It was a great place to shop, and she did love to shop, but it wasn't her favorite place to go. Chanel was tired from walking though, so she went to the Neolodge. She stayed there overnight. Chanel was now down to 100 Neopoints, barely enough to buy a Neocola with. So Chanel walked around window-shopping at all the stores that she once could have bought out. She saw rings, beautiful dresses, delicious baked goods and many other treats that she longed to have again. It was then that she realized that all the things that she used to have, most Neopians never had. Most people can't afford beautiful dresses and rings and all these wonderful things she was accustomed to. Most Neopians could never afford to paint one, especially two of their pets with such an expensive paint brush as she had been painted with. Most can't even afford to paint their pets at all. Everything Lea had said suddenly made sense to her. 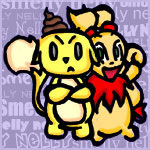 With her 100 Neopoints in hand, she tried to buy some food from the food shop, but with no luck. Chanel then realized that she would have to go to the Soup Kitchen for food. She started crying at the fact that she had left everything that she had behind for this. She had left everything behind to starve on the streets of Neopia with nobody to take care of her. She walked through Neopia Central all the way to the market place where the Soup Kitchen was located. As she walked up to the Soup Kitchen, she heard a familiar voice. "Here is your soup ma'am, have a nice day! Come back anytime!" "Lea!" she Chanel gasped. "I can't let her see me like this!" Chanel quickly disguised herself and made her way to the door. She stepped inside and waited in line for her food. "Hello ma'am," said Lea. "You seem awfully familiar. Have I seen you before?" Oh no, what do I say? thought Chanel. "You must have seen me here at the Soup Kitchen before. That's all." "You remind me of my sister you know. I miss her so much." "What happened to your sister? Is she dead?" asked Chanel. "No, she ran away from home," said Lea, trying to hold back tears. "I yelled at her one day for spending too much money on little things, while so many Neopians are poor. I only ever wished for her to be more money-wise, not to run away from home. For all I know she could be dead. Oh, I miss her so much!" "She isn't dead, your sister is alright, and she misses you too." "How would you know?" asked Lea. "My sister wasn't the kind of type to help out the 'poorer' Neopians like yourself." Chanel pulled her blanket off her head. "How do I know? Let's just say I know your sister very, very well." "CHANEL!" screamed Lea. "Oh my gosh I've missed you so much! Where have you been? I thought I'd never see you again! Promise me you'll never leave ever again! Promise!" "Settle down Lea. I've missed you so much too, let's go home now. And about yelling at me, it's okay. I know now what you mean about spending so much money on one dress, and buying all those shoes. I'll try to be more careful with our money. And yes, I promise, I'll never leave again."